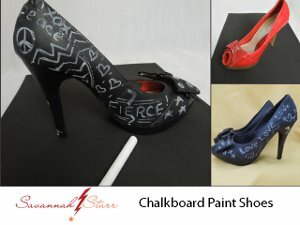 Strut around town in these unique Chalkboard Painted Pumps from Savannah Starr. Truly unlike any other pair of shoes out there, these DIY shoes are all your own, and you can decorate them each day of the week! This is a great way to upcycle an old pair of thrift store shoes and these pretty heels make great gifts for teens or fashionable ladies who are always looking for something unique and fun to wear. Speak your mind with these cute painted pumps. Lightly sand shoes to roughen up the surface. Wipe dust from shoes and be certain that all paintable areas are completely clean of any dust. Paint shoes according to chalkboard paint package instructions. Let dry completely. If you are using a new piece of chalk, be sure to write on a sample surface first to remove the hard outer coating. Otherwise, the chalk can mar the chalkboard painted surface. Write words and doodles. Use soft cloth to remove chalk and re-write whenever you want! Cute, but the chalk is going to rub off on anything and everything.